Heat a dutch oven over medium high heat and place 2 Tablespoons of canola or olive oil in the pan. Salt and pepper the roast on all sides and sear in pan until brown on all sides. Place the onions and garlic in the pan around the meat and cook for a few minutes. Add the rosemary and red wine, stirring to remove the bits off the bottom of the pan. Bring to a boil then place in the oven and cook for 3-1/2 hours. Add the vegetables to the pot by placing them in the liquid around the meat then cover and return to the oven for another 45 minutes or until fork tender. To make the gravy melt 2 tablespoons of butter with 2 tablespoons of flour until it bubbles for a couple of minutes. Add about 2 cups (I added several ladles-full) of the pan sauce to the butter/flour mixture and cook over medium high heat, stirring constantly, until it thickens. Salt and pepper to taste. If the gravy is too thick just add more pan sauce to thin it down. This is perfect timing for me as I 've been looking for different pot roast recipes lately! I'm tired of my old standbys and this sounds just a little different than the ones I usually do. I will be giving this a try. Thanks Michelle! Thanks Diane! Let me know how you like this recipe. 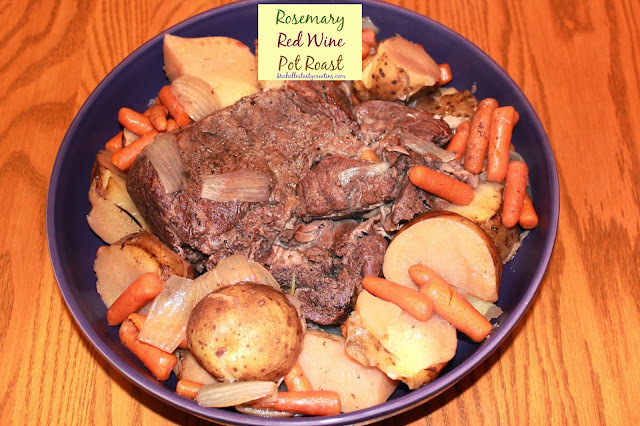 I was in the same slump and even though I love pot roast it needed a updated recipe. I love how this one turned out and have made it several times since creating the recipe. Enjoy! A brilliant recipe. I am sure the wine added in it will enrich the taste buds. I will prefer this at my upcoming party. Thanks for sharing...! I just saw this comment, Thanks so much for stopping by and commenting on my Pot Roast recipe. I hope you have tried this recipe and found it delightful.